Women succeeding in the business world is nothing unusual anymore. While women have always worked and owned businesses, it was really the women’s rights movement of 1848 to 1920 and the women’s liberation efforts in the 60s and 70s that changed the tide. What is relatively new today for women in the business arena is the growth of entrepreneurship. The spade work done during the the previous decades has spawned women-led enterprises that are growing and succeeding at an impressive rate. 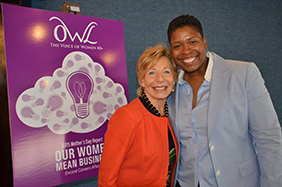 According to OWL — The Voice of Women 40+ — there are nearly 9.1 million women-owned enterprises today that employ nearly 7.9 million workers and generate more than $1.4 trillion in revenues. 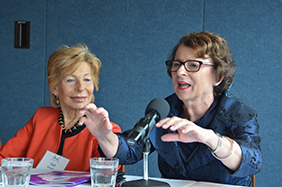 Celebrating its 35th anniversary, OWL began in 1980 as “The Older Woman’s League” in Des Moines, Iowa following the White House Min-Conference on Older Women. The original mission which lives on today focused on economic security and access to health care. Almost four decades later, the organization continues its original mission efforts with the added “entrepreneurship” platform. OWL believes the next economic boom might come from the increasing number of women entrepreneurs. 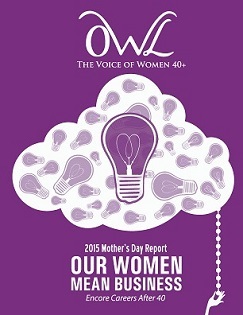 That trend is the subject of OWL’s 2015 Mother’s Day Report, ‘Our Women Mean Business: Encore Careers After 40,’ released recently at the organizations annual event held at the National Press Club in Washington, DC. The report also highlights obstacles that could prevent that potential from being reached, including the meager amount of venture capital going to women. Women received a dismal 7% in VC funds in the first half of 2013 and there are no indications it has gotten any better. 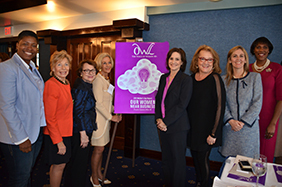 To highlight the success of women entrepreneurs, OWL honored ten remarkable women at the non-profit’s annual event recently in Washington, DC. All entrepreneurs, the role models were celebrated by becoming part of the first “Hall of Notables” for OWL. The selection was based on those women whose lives most embody the spirit of encore “entrepreneurism” – the ability to reinvent oneself, to continually seek out new opportunities and to give back to communities. CAROL GARDNER, founder of Zelda Wisdom, Inc. The event was moderated by Lisa Stark, who is currently freelance correspondent with Al Jazeera America and formerly with ABC News for over 20 years. 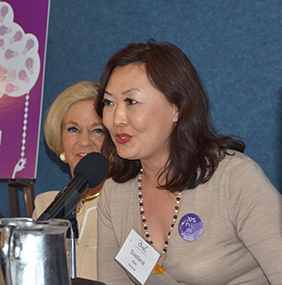 In her introduction of the celebratory panel, she emphasized the value of becoming an entrepreneur. “People not only work longer but are coming back to work,” she said. Carol Gardner, created Zelda Wisdom, a greeting card company when she was 52 years old. Coming from a strong marketing and advertising background, Gardner parlayed what started out as her winning a local photo contest into wildly successful, Zelda Wisdom. Today Zelda Wisdom is credited as one of Hallmark’s #1 card lines and now generates more than $50 in annual sales. 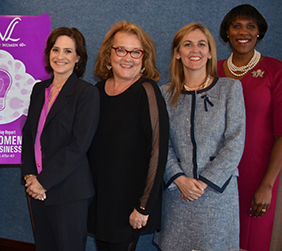 Nell Merlino has mobilized more than 20 million people in movements to promote women’s economic independence. Nell created “Take Our Daughters to Work Day,” started “Count Me In for Women’s Economic Independence,” and launched “Make Mine a Million,” a business growth organization, with Hillary Clinton. 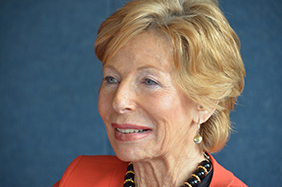 Gail Sheehy has changed the way millions of women and men around the world look at the stages of their lives through her book, Passages, which was named by the Library of Congress as “one of the ten most influential books of our time.” Sheehy has interviewed thousands of women and men, including world leaders such as Bobby Kennedy, Margaret Thatcher, both Presidents Bush, Anwar Sadat and Mikhail Gorbachev. She culminated a decade of covering Hillary Clinton for Vanity Fair with the biography, Hillary’s Choice. At age 70, she figured it was time to turn the lens on herself and wrote a memoir, Daring, about her own passages. Jeanne Sullivan is a cofounder and general partner of StarVest Partners, L.P., a New York based VC firm with over $400 million under management. She helped build the New Media Angel Investors Program in New York. Sullivan was named by Forbes Magazine as one of the top five “Women Changing the World” in her role as an influencer grooming the next generation of women venture capitalists. Her background includes corporate experience at AT&T, Bell Labs and Bozelle Worldwide as well as a managing director for Olivetti Ventures. Sullivan tackled the fear of financing a business issue. “Some entrepreneurs, especially women, think it’s too hard to figure out the financials, understand business models, and do the accounting. I tell every crowd I speak to, ‘You can learn this stuff.’ It’s never too late unless you don’t start,” Sullivan said. 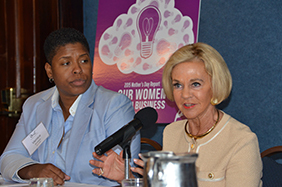 Teresa Younger, CEO and president, Ms. Foundation for Women, has been on the front lines of some of the most important battles for women’s health, safety and economic security. She was the first woman and the first African-American to serve as executive director of the ACLU of Connecticut. 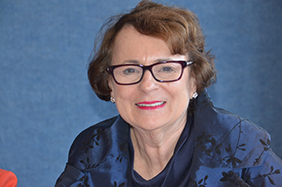 Recently, she concluded her role as two-term president on the board of the Girl Scouts of Connecticut, which serves 46,000 Connecticut girls and 20,000 volunteers. Patricia Lizarraga has over 20 years experience in merchant banking. She is a managing partner at Hypatia Capital, an investment bank that specializes in building relationships with women executives of the Fortune 1000.n She is alaso a prominent investor at Golden Seeds, the investment firm focusing on women-led businesses. Under the gloomy curtain of post-Cold War Russia, Svetlana (Lana) Kim was offered a lifeline – a plane ticket to the US. Arriving in New York and knowing no one, she made her way to San Francisco through the kindness of a stranger who bought her a cross-country bus ticket. Through pure determination, she taught herself English, found a job as a nanny, and landed a part-time job selling cosmetics. She eventually earned her American citizenship and became a Hall of Fame Paine Weber stockbroker. In 2001, Vernice “FlyGirl” Armour graduated from flight school, having earned her wings by graduating top of her class. In 2003, she flew during the invasion of Iraq, becoming America’s first female African American combat pilot. Now, a popular professional speaker whose clients include Delta, NASA, Comcast,PepsiCo and IBM, Vernice has appeared on The Oprah Winfrey Show and The Tavis Smiley Show. She travels the country motivating people to move from Zero to Breakthrough (the title of her book from Gotham-Penguin).